Teachers want ideas that are creative and make teaching their curriculum easier. Schools and districts want an affordable, one-stop solution to help their students succeed. The Mailbox® School & District is packed with 45,000+ fun and engaging ideas, activities, and worksheets that help inspire imaginations while teaching essential skills. For more than 40 years, The Mailbox® has been the leader in providing teacher-created ideas that work. And now your entire institution can have unlimited, simultaneous access to this incredible, growing collection at one low price. The Mailbox® School & District’s classroom tips and tools will help educators build practical skills in the all-important area of successful classroom management—recognized as the #1 characteristic of being an effective teacher. All content is carefully planned and edited by our in-house team of former teachers. Our editors are experienced at assessing what teachers will find valuable and worth incorporating into lessons. The platform is search-based to help teachers find the materials they need quickly, and our editors have categorized the lessons and ideas in all the ways teachers teach, including grade level, curriculum area, and type (worksheet, craft, game, etc.). All of the activities and ideas in The Mailbox® School & District are educationally sound, practical, easy to use, error-free, and child-centered. The Mailbox® Advantage: More than 80% of today’s teachers know The Mailbox®—and 85% of them have used The Mailbox® ideas in their classrooms. Teachers have total confidence that, when they work with an idea from The Mailbox® to introduce or reinforce a lesson, they are spending their time wisely. The Mailbox® also reminds educators how much fun teaching can be and shows them how to make learning fun for their kids. 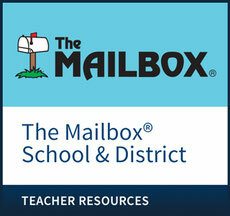 The Mailbox® School & District offers all of these advantages at an institution-wide level with no banner ads, the ability to build complete lesson plans with the Lesson Plan Builder at no additional cost, and access to activities and ideas at all grade levels from prekindergarten through grade 6. By Teachers, for Teachers: Ideas and activities from The Mailbox® School & District are teacher-created, teacher-tested, and educationally sound. For each activity, our editors have followed the instructions, filled out the forms, and answered the questions to make sure there are no gaps, missing steps, or missing materials. Save Time on Lesson Planning: Many teachers get less than 40 minutes of planning time a day. The Mailbox® School & District’s intuitive design and features, including its Lesson Plan Builder, make it easy for teachers to find and assemble activities and ideas quickly, saving precious time and preventing headaches. Teachers won’t have to spend another weekend planning lessons—we do much of the work for them! Always Fresh and Up to Date: The Mailbox® School & District highlights new content every month, with skills and topics right when teachers need them. Eight to ten activity packets and 80–100 pages of new content are added for each grade level every month. Users can sign up for email alerts to let them know as soon as new content is available. Educationally Sound Materials: The Mailbox® School & District uses a multi-pronged approach to ensure that every activity, if applicable, is labeled with the correct skill. Our editors study and refer to the Common Core State Standards, Next Generation Science Standards, the standards for non-Common Core states such as Virginia and Texas, Head Start Early Learning Outcomes Framework, and EngageNY’s Prekindergarten Standards as they label activities with skills. Editors also refer to a variety of textbooks and educational websites for examples of how each standard/skill is executed. Lesson Plan Builder: With The Mailbox® School & District, users can create and save personalized lesson plans—comprehensive plans with activities that introduce a skill, sheets to practice it multiple times and multiple ways, an assessment that checks for understanding, and extra practice to ensure all learners get it—with all the required elements in one location, at no additional cost. The Lesson Plan Builder draws upon a collection of more than 500 lessons to help teachers assemble a personalized lesson plan that is leveled for all learners. Teachers can easily print out their lesson plans for their own use, to hand in to administrators, or for substitute teachers to use. Make & Print Tools: The Mailbox® School & District allows users to customize a variety of resources, including flash cards, bingo boards, spelling lists, math tools, language arts tools, and more. My Mailbox: Users who sign in to The Mailbox® School & District can save any ideas, activities, and worksheets they’ve been working on in their Collections folder. The Print Packet allows users to save multiple ideas and print them all at once with just one click—ideal for the busy teacher who finds lots of great ideas but doesn’t have time to print them out right away. Users can schedule lessons with their online planning calendar and store the lesson plans they’ve built using My Lesson Plans.